Remember the cute lil’ girl played the ukulele and sang her original songs from America’s Got Talent Season 11 of 2016? 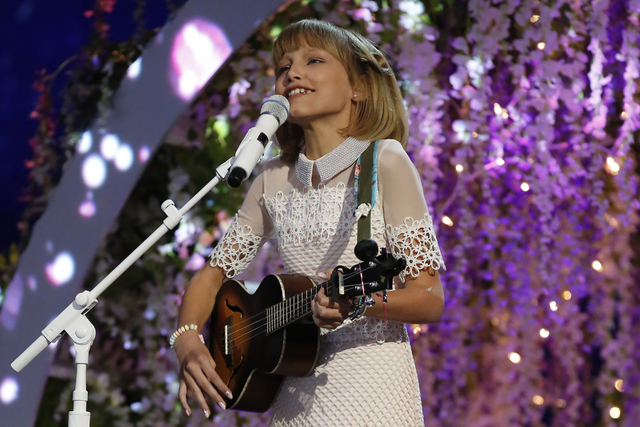 With her ukulele in hand, Grace VanderWaal performed “I Don’t Know My Name” that resulted in a standing ovation and rave reviews from the judges and viewers at home. On her audition day, “Do you believe you could win,” Simon Cowell asked the New York resident. Grace replied, “Well I mean miracles can happen so possibly.” Grace who at 12 years old won American’s Got Talent two years ago. Simon previously predicted that Grace would become “the next Taylor Swift.” However, she would like the comparisons to please stop. Grace expressed on her social media video two years ago that she doesn’t want to be compared to other artists. Yes, she does have a tiny shadow of Taylor on her – after all, her music inclines towards pop and accompanies it with her ukulele just like Taylor does with her guitar. Might we iterate, perhaps that is not the impression of Taylor Swift that Simon and most of the people in the world sees her as. Taylor Swift has been a booming artist ever since she started her career in this industry. And that is the footstep that Grace is able to follow on. While many finalists from various competition shows step out of the spotlight soon after being crowned the winner, Grace has developed a loyal fan base and strong spot in the music industry. For starter, Grace was signed to Columbia Records and Simon Cowell’s personal label Syco Music since being crowned champion and has released a successful EP “Perfectly Imperfect” in December 2016. She has been named to Billboard magazine’s 21 Under 21 list of fast-rising young music stars in three consecutive years (2016–2018), received the 2017 Billboard Women in Music Rising Star Award, and is the youngest person ever included in Forbes’ 30 Under 30 Music List. How amazing is that! In November 2017, Grace released a full-length album, “Just the Beginning”, and then she conducted her first concert tour. And now venturing into acting, Grace secured the lead role in Disney’s “Stargirl”, one of the first original films to premiere on the company’s upcoming streaming service. If you watch such reality shows, you’d know that winning the show is one thing, but actually going out and making music, as well as coping with a new level of fame while trying to create work you’re proud of can be an obstacle. But Grace has took the challenge and is paving her path successfully indeed.